Inzinc provides ISO 9001 Certification in India to ensure that our clients reap the benefits of establishment, implementation, maintenance and improvement of a Quality management system. Organizations that implement and get certified to the ISO 9001:2015 standard ensure the establishment of a Quality Management System to consistently meet customer and other interested party requirements thereby achieving their business objectives. The latest ISO 9001:2015 standard was published by the ISO on 15th September 2015. This standard version effectively cancels and supersedes the earlier ISO 9001:2008 version. Better relationship management with the interested parties. Reduction in operational wastes thus ensuring lean management. Puts a solid foundation for continual improvement culture in the organization. Opens the door to global business opportunities. Provides better cutting edge over fellow competitors. It is a matter of pride to achieve and sustain the ISO 9001:2015 Certification for an organization. The engagement of employees can be a morale booster since employees feel recognized and valued for their ideas and suggestions to improve organization and its processes. In today’s dynamic world, change is the only constant. ISO standards are not an exception either. The ISO has recognized the need to keep standards up-to-date to help stay relevant to the modern technology, concepts and practices prevalent in the marketplace and keep pace with the changes in the global economy. To guide organizations in adapting to the growing customer needs, the ISO 9001 has undergone revision from the 2008 version to the 2015 version, whichwas published in September 2015. Risk based Thinking: The new ISO 9001:2015 version gives more importance to risk based thinking. It emphasizes on a risk-based approach. Risk will be integral to the entire quality management system. Preventive action from ISO 9001:2008 has been replaced by risk management and planning. 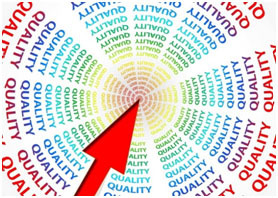 ISO 9001 Documentation: The requirements of the new version are less prescriptive. For instance, instead of the explicit need for traditional documentation like a quality manual, it suggests for a more flexible documented information. However, this will not imply that organizations who currently have a quality manual need to change or discard. It is only that the flexibility of documentation is increased, where relevant information can be retained and can be made available when needed. This makes it more flexible for service-related organizations. You will have to transit your quality management system from ISO 9001:2008 to the new ISO 9001:2015 and seek certification to it. However, you will be given a three-year transition period from September 2015 to move to the 2015 version. This implies that, after the end of September 2018, a ISO 9001:2008 certificate will not be valid any more.